It was announced on Tuesday that the World Series of Poker Asia Pacific (WSOP APAC) will now take place once every two years, beginning with October 1st – 17th, 2014. It will alternate years with WSOP Europe. The 2014 WSOP APAC Schedule is expected to be announced soon, with an increased roster of ten bracelet events. One of the biggest stories of the year was when the World Series of Poker came to Melbourne for the first time. The 2013 WSOP APAC was a big success, with five coveted WSOP gold bracelets being awarded to players such as Phil Ivey winning the WSOP APAC mixed event and of course, Daniel Negreanu overcoming a field of 405 to win the $10,000 WSOP APAC Main Event. Now, some changes to the dates and plans for the future of WSOP APAC have been announced. The WSOP APAC will continue to take place at Crown Melbourne for the foreseeable future, but it will now take place once every two years. The date has also been moved for the second-ever iteration of the World Series of Poker Asia Pacific, with the 2014 WSOP APAC schedule set to take place October 1st – 17th. This change also means that the WSOP APAC will alternate years with WSOP Europe and so the WSOP APAC will take place in 2014 and 2016, while WSOP Europe will take place in 2015 and 2017. This decision seems to have been made due to an increasingly crowded yearly world-wide tournament schedule and will certainly allow the international editions of the WSOP to be bigger than ever before. The World Series of Poker has stated that the plan for the foreseeable future is to have WSOP Europe take place on odd years (2015, 2017 etc) and for WSOP APAC to take place on even years (2014, 2016 etc). It has also been announced by the World Series of Poker that the 2014 WSOP APAC schedule will feature ten bracelet events, as opposed to the five which the 2013 schedule featured. This aligns it with the current amount of bracelets events at WSOP Europe. Crown Melbourne has also guaranteed 150 satellite qualifiers into the 2014 WSOP APAC Main Event. This move will also likely help bolster the numbers for the Aussie Millions as the Australian poker economy will have less $10,000 events on its schedule and also because of the date change leaving more of a gap between the Aussie Millions and the WSOP APAC. This announcement also comes on the back of the recent partnership between the APPT and the Aussie Millions. The 2014 WSOP APAC is planned to be filmed for a global television audience and the official 2014 WSOP APAC schedule is expected to be announced in early 2014. 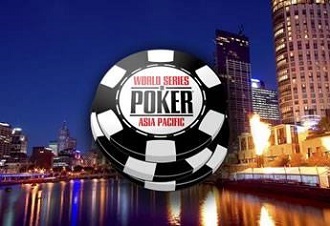 Check back with Poker Asia Pacific for all the latest WSOP Asia Pacific news. Make sure to keep your browser locked to Poker Asia Pacific and like our Facebook page, follow us on Twitter, or join our Asia-Pacific and Australian poker forum to stay up to date with all the latest news and results from poker in Australia, the Asia Pacific and the world.